As any parent knows, bored and whingy children equals grumpy mums and dads. This list is all about helping them have a good time so you can avoid a headache and resist the urge to throttle your own offspring. Obviously, what's appropriate in this line up will depend on the age of your kids, their temperament, and of course (let's be real here) your wallet. There's a magic about a toy store that brings out the child in every adult. 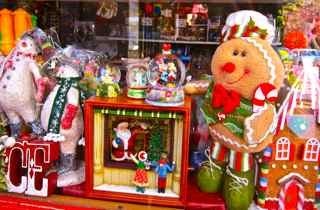 Leura Toy Shop and the Christmas themed Christmas Cottage at Leura Village - that quaintly named little township that exists just prior to hitting Katoomba – are worth a visit. Both are in The Mall (aka the main street). We're not talking Toys R Us, but unique, quality, non mass- produced toys. If the kids can't be delighted here, they have far too many toys for their own good. A possible bad weather option, if nothing else. Expect to be hit hard in the wallet though. 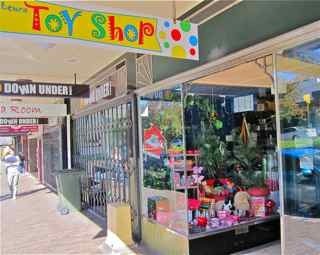 Of the two, Leura Toy Shop has more room to browse. On my last visit, I found the staff friendly and tolerant of my child's natural propensity to want to manhandle everything. This wasn't the case at the Christmas Cottage, a small cramped shop a few doors down. Still, the magical displays make it worth a look. Expect to be trodden on by others cramming into the small galley type space. Leura Toy Shop - delightful! You can also find a smaller selection of kids toys at Leura Gift's and Homewares, next to the Christmas Cottage. Apart from the Three Sisters, this is the main tourist hub in Katoomba so expect to find crowds and expect it to cost you. 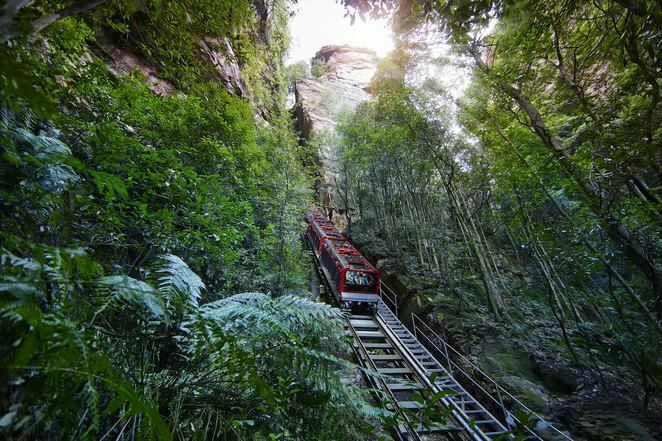 Scenic World is an agglomeration of tourist type activities - operated by the Hammon family - that include the Scenic Railway, Cable car, Skyway, revolving restaurant, cafe, plus souvenir shop and a constructed platform walk through the bush. Despite the bite on one's wallet, the brief plunge on the Scenic Railway (the world's steepest railway), is one of those experiences that like ice-cream in summer, seems to find a place in the memory of every Australian and many a tourist to the Blue Mountains. It will live on in the memory of your child. However, I will warn you, a twelve year old boy I accompanied on the rather tame and partly wheelchair accessible Scenic walkway, found the platform walk boring, and the rides are over all too quickly. To get to Scenic World, drive towards the Three Sisters end of Katoomba Street. Before you get to the end of the street, take the right hand turn at the Scenic World sign, descending into Katoomba Falls Road. Follow the signs to Scenic World. It is located at the corner of Violet street and Cliff Drive and has a massive carpark. Scenic World has a very efficient and high-tech website that lists such factors as the current visibility, wind and temperature in its' Katoomba Weather and Ride Report. There's also live webcam of the view to the famous Three Sisters, that somehow brought to mind the Hollywood sign on the Hollywood Hills. This is trash tourism that still manages to evoke something uniquely Australian. Older kids and their parents generally get a lot out of this, whereas the guide led tours may be unsuitable for toddlers and babies. That depends of course on your child's temperament and how long they can keep their mouth shut. Your child's whining and winging through the tour guides' talk isn't a good look and neither is a poop in the confined space of the cave, yet I've heard of many a parent who's taken little Johnny along and still managed to have a ripping time. Cave activities include self-guided tours, guide-led tours, adventure caving, night and ghost tours and cave concerts. There are discounted and family tickets and multi cave packages. which adults aren't allowed to partake in. These cater to the 7-12 year old age group. For the more adventurous teen (minimum age ten) there's the Plughole Tour. The unspoilt rather mystical natural features of this 2011 Tourism Australia Award winner are what makes this place so special. The ancient limestone caves are awe-inspiring and the aqua waters of the Blue Lake from whence you can take the Jenolan River Walk, are magical. The caves maintain a constant temperature of about 15 to 16 degrees Celsius, curiously touted as a positive on the Caves official website, so dress warmly, but don't overdo it. Tours to the caves are at set times during the day and take different amounts of time to complete. 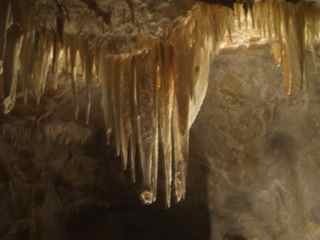 Look up the Jenolan Caves website before you go. On busy weekends, such as the school holidays period and Easter, it pays to pre-book. There's also a cafeteria onsite if little Johnny gets hungry. Alternatively, dine at the more expensive Chisolm's restaurant. 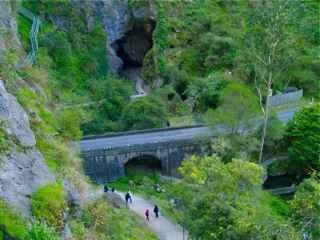 The drive to the Caves, passing pine forest then along ascending cliff tops overlooking deep gorges and mountains on Jenolan Caves Road, is spectacular in itself. This winding, sometimes one-way road, will take you through elevations of up to 1300 metres above sea level and the highest points of the Blue Mountains. Pack ginger lollies to alleviate potential car sickness. The Jenolan area is moody, if not slightly creepy, a thing the kids might find enjoyable. This is a rewarding and educational day trip experience for adult and child alike. Jenolan Caves is only accessible via car or coach tour. To get there follow the Great Western Highway along the Blue Mountains to Hartley. At Hartley watch for the sign to Jenolan Caves telling you to turn left. Follow the signs all the way. Note: there are no petrol stations at Jenolan Caves and the road is unsuitable for caravans. It's a three hour car trip from Sydney (partly due to all the twists and turns on Jenolan Caves Road that slow the voyage), so make a loo stop for little Johnny before you leave civilization - at either Katoomba or Mount Victoria. From Katoomba, the caves are approximately one hour away, so break up the trip with a visit here if you like. There is also accommodation onsite at Caves House if you dare to stay overnight. Watch out for the ghosts. Rumour has it the place is haunted. Jenolan Caves - haunting and mystical. The Edge Cinema has one giant Maxvision screen with tiered amphitheatre style seating which makes for an enhanced movie experience. Be aware, not all the movies show on the big screen - the Edge has other movie screens with regular size screens. Call them and ask for what is screening on the big screen if you want the big movie screen experience. A word of advice: get there early as the candy bar and cinema tickets are purchased from the one spot and this system often results in a lot of waiting around. The Edge Cinema is located on the Great Western Highway at Katoomba. Just before you hit the turn-off into Katoomba, turn right at the traffic lights into Civic Place. There is plenty of parking and cinema seating – well, the majority of the time I've been there. 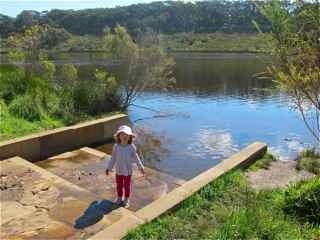 This man-made lake, created by the damming of Jamison Creek, is a bit of a hotspot for the local mama's and papa's. The grassy forefront of the Lake serves as a park and has the usual swings and playgrounds equipment. There's also a make-shift pirate ship and on a more practical level, tap-water, public loo's and BBQ facilities. On a sunny, wind-free day it's also a fabulous picnic spot. On a chilly day the same can't be said. It's suitable for toddlers and young children (a la play equipment) and for older kids who may want to kick a ball around with you (that's if you have any life left) or skateboard or roller blade on the path. If your toddler is anything like mine they'll want to get in the water, so bring spare clothes and shoes. Also bring spare bread or lunch leftovers to feed the ducks. This might seem like an unexciting option for something to do, but hey, what kid doesn't like to play with pebbles and water, chase ducks and hop on a swing. The simple things still provide the most fun. Originally, a water supply for steam trains, it's now a popular spot for small dinghy's, canoe's and model boats. To get to the lake from Sydney, turn right at Station street (the main street of Wentworth Falls bordered by shops and the rail station). There are traffic lights here. Take the third left into Sinclair Crescent. Look out for the lake on your left. You will find plenty of parking on site. This majestic botanic garden, managed by the Botanic Gardens Trust, has space for little ones to run around without annoying anyone while you take in the views. At any rate, a walk through this 252 hectare size garden might burn them out, but be warned you might have to carry them back to the car. Take a pram with you if that's a possibility, or a big strong man. Mt Tomah (as it's more regularly known), is 1000 metres above sea level and the highest botanic garden in Australia. 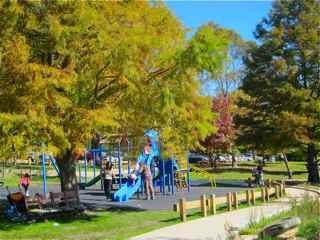 The ample grassy grounds provide opportunity to picnic or stroll. There are often activities for kids during the school holidays. Check out the Mount Tomah Botanic Garden website if you are contemplating a visit and see what's on. Admission is free and there's a restaurant, toilets, gardening shop and BBQ area on site. The garden is mostly accessible to prams and wheelchairs with many flat paths. There is also an additional service to assist the disabled and wheelchairs can be hired on site. There is lot's to look at including over 6,000 different species of plants. Little ones might enjoy touching the various textures of plants as well as the fountains, rock gardens and pools with their fish and lizards. Adults will find repose and calm in the trickling waters, vast views and dignified trees. In Spring the gardens are particularly pretty with their fiesta of daffodils. During my last visit, a friendly gardener informed me that the plantings are timed to flower in stages, so there is always something to look at whichever time one visits. Now, that's customer service. The Mount Tomah Blue Mountains Botanic Garden is on the Bells Line of Road via Bilpin about 2 hours drive from Sydney. To get there, follow the Bells Line of Road from Richmond. 40km west of Richmond, look out for the signs. Alternatively, if you are travelling to the Blue Mountains go to Mt Victoria. Turn right at the township's lights into Station Street and continue east on the Bells Line of Road. Follow the signs. There is no public transport to the garden, however you can join a tour bus. Admission to this old mansion, set up as a toy museum, costs $16 for an adult and $8 for children, though as the non-advertised price apparently changes, don't quote me on that. Don't expect to stay long or to feel comfortable here. A trip to Leuralla feels like visiting a cranky old aunt. The place is littered with out of bounds zones and signs warning about alarms that will go off if you over-step the ropes set up to keep you out. Quite alarming was a sign on an old telephone warning of the possibility of electric shock for those game enough to touch it. None of the other people visiting when I was there stayed for very long and one man had his backpack confiscated and put behind the counter by the owner (the cranky old aunt I referred to before). I have read quite a few bad reviews of Leuralla by parents which include comments about quickly bored children, rude staff, dustiness and overpricing in terms of what there is on offer. Nevertheless, it's a potential time-killer on a bad weather day, when you're feeling somewhat desperate for something to do with Little Johnny. What you will see is a range of antique toys behind glass cabinets, ranging from Tintin to Dr Who, however dolls are the main feature. Expect this visit with kids to take anything from five minutes to an hour of your time, depending on their attention span. Please note another rule - photography is not allowed here. If this still appeals to you, Leuralla is located at 36 Olympian Parade, Leura. Head down the main street of Leura and follow the signs. For further information, see the website. If you want a hike, then you've certainly come to the right place. The Blue Mountains is infested with the things, not to mention waterfalls, bird life and sweeping vista's of cliffs, valleys and mountain ranges. After all, isn't this what you came here for? What's appropriate here obviously depends on the age of your child, and your own level of fitness. 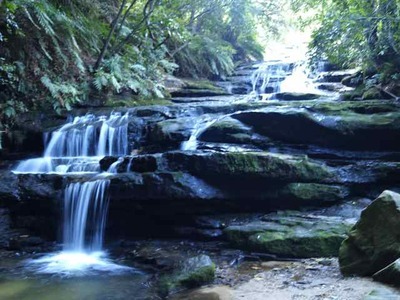 Some short and easy hikes suitable for kids include the Leura Cascades walk to Bridal Veil Falls, or at Katoomba, the Prince Henry Cliff top walk, Katoomba Falls Circuit, the Gordon Falls to Leura Falls walk and the Three Sisters walk. For a comprehensive list of Blue Mountains walks, their approximate length and grading, go to the Blue Mountains website. If you feel game, camping is another fun option for kids, but I'll explore that more complex subject in another article. What makes horse riding here special is the location. Vista's of cliffs and gullies, treks along ridges and through forested glens, make this an experience that is far more than a mere horse ride. To get the experience, visit the Megalong Horse Riding Centre. It offers pony rides for little ones at a cost of $10 for ten minutes – basically two rounds. Parents are required to lead the pony. According to the owner there is no need to book for pony rides. Just rock up in normal business hours. Please note, the children's farmyard advertised on the website is no longer in operation. Megalong Horse Riding Centre is located on Megalong Road, the main road through the Valley. If driving, go to Blackheath and turn left at the town's traffic lights, over the railway, then follow the signs to Megalong Valley. You will pass 25 minutes of lush rainforest and a tea room before you arrive at your destination - potential fodder for more things to do. For more specific directions go to the website. The centre apparently does pickups from Blackheath station, however, best to confirm with them. After that bush walk or horse-ride, you and the kids might want to pop in for a hot chocolate at one of the many cafes in the Blue Mountains. Add scores of 1920's old world charm and you have The Paragon in Katoomba, an iconic restaurant / cafe with art deco style decor and an enticing display of hand made chocolates. It's an experience in vintage, though in some respects a little on the tired side and the prices won't do much for your wallet either. The Paragon is on Katoomba Street (main street of Katoomba) at number 65. 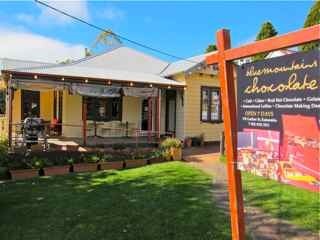 For something more casual, visit the Blue Mountains Chocolate Company, a cafe style shop that has a deli feel about it. A hot chocolate costs ten dollars here, but is apparently out of this world. As a health junkie who avoids such things like the plague I can't really comment. Gelato, international sweets, hand-made chocs and light meals are also on offer. On a cold day, the Paragon has a cosier though dimmer atmosphere, while on a warm, bright day you can sit on the outside verandah of Blue Mountains Chocolate. Parking is fairly easy to find on the street and Echo Point is just a short stroll down the road if you need to walk off any excessive chocolate consumption. Blue Mountains Chocolate Company is located at 167 Lurline Street, the street parallel to Katoomba street that takes one down to the Three Sisters. Once you pass the corner store on your right, start to look out for the cafe on your right. If you are not travelling by car, the Trolley Tour bus stops at Blue Mountains Chocolate Company, as well as most of the other places mentioned in this review. Hop on the red tourist bus and you can visit all the above (excepting the Caves which requires a separate tour bus, and Megalong Valley). The trolley bus stops at 29 different locations including Leuralla, Leura Mall, Echo Point, the main street of Katoomba, Scenic World, Leura Cascades, the Carrington Hotel and the Everglades Garden. Tickets for the red (hop on and hop off) bus, can be purchased from the driver when you hop on, or from The Trolley Shoppe located at 76 Main Street Katoomba (opposite Katoomba Railway Station). For more information and a list of frequently asked questions, see the Trolley Tours website. You might want to skip the feeding the Wentworth Falls Lake ducks, if you must bring oats instead - much better for their guts. Too many people feeding the poor buggers bread. "When wild ducks are fed human food (especially bread or crackers) their organs become engorged and fatty, which can cause them to suffer from heart disease, liver problems and other health complications. Bread also has very few nutrients, and can get compacted in a bird's crop. Many rehabilitators see "bread-impacted crop" in sick and distressed park ducks." "Once you pass the corner store on your right, start to look out for the cafe on your right." No. The Chocolaterie's on your left. TCP Garden Tours visits Mt Tomah Botanic Gardens and is happy for children to come aboard. There is even a child booster seat on the minibus for the smaller children. You can read a review of TCP Garden Tours on this website. Happy Gardening. Thanks for that excellent info.